Investors should be aware that another tech boom appears to be underway. Exuberant valuations, zero profits and knowledgeable private equity owners lining up to sell their stakes are painting a cautious picture for technology stocks. This time the boom surrounds the conga line of technology unicorns that have filed to list, or are rumoured to do so, this year. Because much of the rally in markets since the GFC can be attributed to technology stocks, it is important to understand their history, their profitability, their pricing and their future. After the GFC, when US short-term rates were set to zero, saving money was unappealing. Investors searched high and low for yield and returns and a great deal of the abundant money found its way into speculation on property, fine art, collectible cars, and private equity funds. These private equity funds, flush with cash, funded the growth of loss making technology companies over many years. And despite their losses, investors kept cheering as these companies grew users, trips, rideshares and posts. What many of these companies didn’t do however was grow profits. And the future must include profits. Let’s take a quick look at three of these companies that are about to list or have recently listed. Irish rock band U2 wrote some profound as well as poignant lyrics around the turn of the 21st Century and one of the most thought-provoking has to be from their song Beautiful Day, ‘what you don’t have, you don’t need it now.’ That’s the line that comes to mind when I look at Pinterest, the digital social picture board owner that has announced its going to IPO earlier than expected to take advantage of the hype surrounding the oversubscribed floats of fellow loss-making ‘unicorns’ Lyft and Uber. I don’t have Pinterest and I don’t need it. In fact, I think few users actually need it. After recording a loss of US$130 million in 2017 Pinterest reported a reduced loss of US$63 million in 2018 and a profit of US$47 million in the last quarter of 2018. But keep in mind the company was founded more than a decade ago, in 2008, and has raised more than US$1.5 billion from venture capital investors. It’s a long time for investors to wait for any return. No wonder they want to see the stock sold. In its most recent funding round in 2017, the company raised US$150 million in a Series H round at a valuation of US$12.3 billion. Ponder that number for a moment. Unlike some of the other unicorns, Pinterest has a revenue stream. In 2017 the company generated revenue of US$472.9 million and in 2018 revenue grew circa 60 per cent to US$755 million. The most recent venture capital investors however must hope that the growth continues because buyers of the IPO will have to be willing to value the company well above US$12.3 billion for the Series H investors to make money. In the company’s S-1 IPO Registration Statement, Pinterest notes that international expansion is one of its top priorities. In the US, where the bulk of revenues are generated, Pinterest grew its revenue per user by more than 45 per cent to US$9.04 per user. Globally however the company earns just US$0.25c per user. And remember this is after operating for more than a decade. Google and Facebook however may disagree with that last claim. Google generates over half its revenue outside of the US, and Facebook’s international revenue per user amounts to 61 per cent of US users. Twitter also reports between 40 per cent and 60 per cent of its revenues come from outside the US. So, it seems that after ten years of operating the business and after employing US$1.5 billion, a poor revenue per user outside of the US is due to something else. That ‘something else’ may represent the reason their floating now. Time will tell. 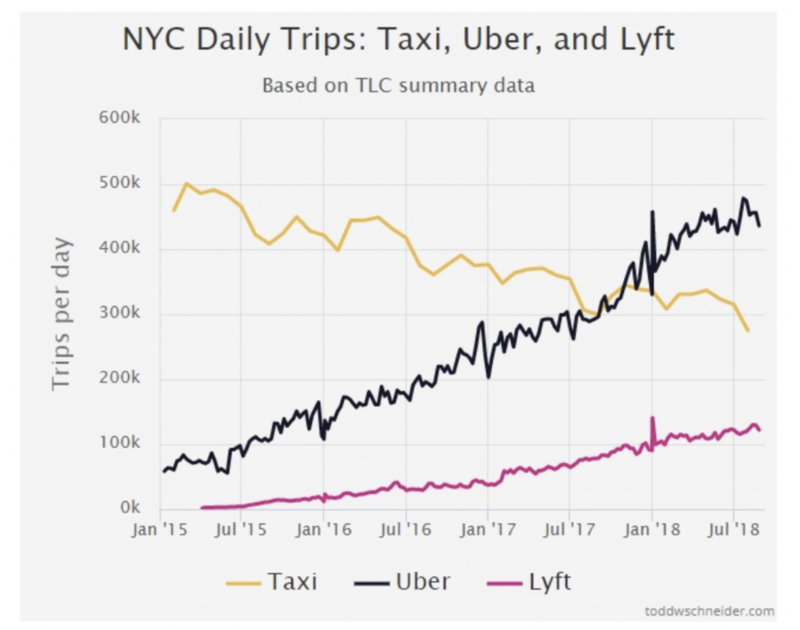 I was fascinated to see the below chart of daily trips in New York City and the rapid adoption of Uber, and to a lesser extent, Lyft. Obviously, New York’s experiences say a lot about the Uber story globally. Indeed, the London chart looks surprisingly similar. One of the reasons Uber has been able to overtake taxi rides is simply the fact that there are 63,000 Uber vehicles available to New Yorkers versus just 16,000 yellow cabs. But given there are also more Lyft vehicles (34,000) than yellow cabs, supply cannot be the only reason. Indeed, the fact that cab trips are declining rather than standing still suggest something else is at play. That other major reason is price. You see, Uber is popular because its app makes it much more convenient to book a ride and in many places around the world the price is often cheaper than a cab. The pricing however has not been high enough to recoup the investment in the technology. To get a return on their investment, investors have come up with another technique that has nothing to do with operating the business. It’s called an IPO. As is often the case with world-changing technology, what is good for consumers is not so good for investors. Uber would have to charge much higher prices if it wanted to make a profit and recoup the US$6 billion it has lost its owners in the last two years alone. It also lost just under US$900 million in the last quarter of 2018. Uber is popular because its price is not reflective of its true cost of supply. At current pricing it generates a negative return to its shareholders. Were it to charge a price that wasn’t aimed at market share, but was aimed at the cost of recouping the investment and generating a reasonable return to owners, that price would be much higher and its popularity may not be so laudable. Almost by definition, Uber exists thanks to the benevolence of its shareholders who, like Pinterest shareholders, have been waiting for about ten years with no sign of a cash return. No wonder they want the company to IPO. In the case of Uber, the valuation is expected to be more than US$120 billion (remember it lost US$6 billion over the last two years and the losses aren’t getting smaller). Again, as with Pinterest, the investors in the most recent funding round will need a US$100 billion plus valuation to be able to show any return. Perhaps Uber’s strategy to emphasise its forthcoming quadcopter-hailing air transport solution will succeed in distracting forthcoming investors from forthcoming losses. Potential Uber investors need to be aware of the growing adverse narrative towards the company. There’s the subject of workers’ rights – Uber, like other sharing economy companies, succeed by contracting operators rather than employing them thereby avoiding holiday, health and retirement obligations. Uber’s services have also been restricted in several jurisdictions. The EU declared the company a taxi company rather than a technology company, requiring drivers and their vehicles to undergo the same checks as established taxi operators. In London Uber was denied a license renewal after attacks on passengers lead to concerns about the background checks conducted on drivers. The company continues to operate only while its appeal is pending. In Denmark and Germany Uber is banned. Finally, Lyft recently listed on the NASDAQ and just after one day of trading shares fell below their IPO price. So popular is this loss maker (Lyft, declared a 2018 loss of US$921 million) that its offer of shares was oversubscribed in a few short days. With that kind of investor behaviour you can understand why early and extremely patient private equity investors are now rushing to IPO. Keep in mind vendors rarely, and certainly not willingly, sell their ownership in a market that gives value to the buyer. Excellent piece Roger. People should read Marathon Asset Managements letters from 1990s. Book Capital Account. Today has many similarities to the past. When Amazon listed how much profit was it making? @John re. Amazon: Amazon has been very successful in reducing costs in markets that were very inefficient. Uber/etc may be able to do the same if/when technology like self-driving cars become a thing. Unless someone else beats them to it.